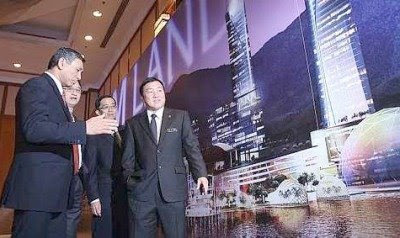 KUALA LUMPUR: IJM Land Bhd is in talks with various parties to venture into mixed property developments in China’s second-tier cities. Managing director Datuk Soam Heng Choon said these new projects were likely to be commercial and residential developments and they could be done through joint ventures with local partners in China. “IJM Land is always in talks with parties either locally or abroad for joint property projects. “We haven’t set any time frame for the new ventures in China,” he told reporters after the launch of IJM Land’s new corporate identity yesterday. “Our people are there and we will continue to look for new business in China and replicate what we have done in Malaysia, such as niche and township developments,” he added. IJM Land expects its China ventures to contribute to profits in the next three to four years. The company now has a presence in Changchun where it is jointly developing a RM500mil mixed property project. Soam said it expected to launch the project next year. He said China represented its second overseas venture after Singapore and IJM Land also planned to tap other emerging markets like Vietnam. Soam said the company was also looking at en bloc sales for its upcoming commercial projects in the Klang Valley and elsewhere. “We are talking to fund managers operating out of Hong Kong and Singapore and these could be European or American funds,” he said. Asked whether IJM Land was on track to launch 28 projects in the financial year ended March 31, 2009, he said it was reviewing some of the projects and might put some on hold. He said upcoming projects might have higher selling prices which were adjusted according to the construction costs. Soam said margins were mainly squeezed for lower-end products and there was still demand in the medium to medium-high market. The unveiling of IJM Land’s new corporate identity and logo yesterday signalled the completion of the rationalisation exercise involving RB Land Bhd and IJM Properties Sdn Bhd. It also denoted the company’s emergence as a major player in the Malaysian property scene. The new entity brings together RB Land’s proficiency in township development and IJM’s expertise in high-rise condominiums, niche developments and commercial buildings. SUBANG JAYA: IJM Corporation Bhd may place out IJM Land Bhd shares that it owns to institutional investors, as part of its efforts to unlock liquidity at the group level. IJM Corp managing director Datuk Krishnan Tan said ideally, the group would want to own a 60% stake in IJM Land, but it would only consider placing out the shares once market conditions had improved. He said IJM Corp preferred to place the shares to institutional investors as IJM Corp itself had many institutional investors on its shareholding list. Topping the list is the Employees Provident Fund (EPF), which owns about 20.5% of IJM Corp. Nevertheless, Krishnan said IJM Corp was still comfortable with holding the bulk of shares in IJM Land and would not place them out immediately. IJM Land was a creation from a merger between RB Land Holdings Bhd and IJM Properties Sdn Bhd, which was completed a week ago. Krishnan said IJM Land would focus on developing its more than 4,046 hectares of landbank in the country, instead of aggressively pursuing overseas markets given that IJM Land was still early in the game. “We have been lesser known as a property player but with the merger completed and a huge landbank now, IJM will be put to the forefront as a serious developer, just as we are as a construction player,” he said. Apart from developing its huge landbank in the country, IJM Land has a 50% joint-venture to develop a RM500 million-mixed property development project in Changchun, China. Its managing director Datuk Soam Heng Choon said IJM Land would eye expansion opportunities in other locations in China, particularly second-tiered cities and said the developer was “always in talks” with local and overseas investors to get more businesses. “We have various options, and we hope to replicate our success in China as we have experience in developing niche property development projects and townships,” he said, adding that expansion in China would be IJM Land’s direction in the next three to five years. Soam said IJM Land had not received any overseas contributions to its revenue, but would see revenue streaming in from its development project in China within the next three to four years. On the local front, he said currently IJM Land’s plates were full, as it had more than 60 on-going projects and planned to launch another 28 new projects in FY09. He said given the tougher operating environment and higher building materials costs, the developer was constantly reviewing its plans and might hold back some of the projects planned. “So far, we have not faced any significant costs overruns, but our low-to-medium end housing projects might be affected from increased building costs,” he said. However, Soam said although margins from its low-to-medium housing products might be squeezed mainly due to rising building costs, they would be mitigated by commendable sales of medium-to-high end and commercial products that gave better margins.